I’m doing this the wrong way around, aren’t I? First blogging about an event from yesterday and then about an event from two days before that. 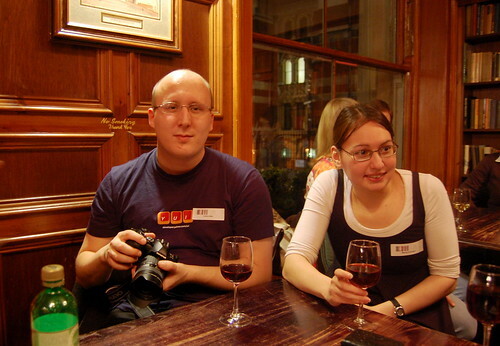 Heck, if I have time, I might even blog about Barcamp Brighton 2, even though that’s been already two weeks ago. 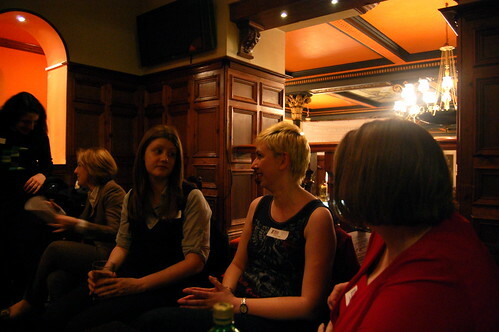 Anyhow, last Tuesday I made my way to the 18th Girl Geek Dinner, this time held at The Knights Templar. The main theme was SEO (search engine optimisation) with all speakers supposedly talking on this subject. Juddith “deCabbit” Lewis held a great talk explaining the basics of SEO. It was actually an hour long presentation she uses for her clients, cut down to only 15 minutes. I would have liked to hear the full talk, cause that would have been so much more interesting than the stuff that came after that. The second talk was from Sheila Farrell about Semantic Markup and Organic SEO. I don’t want to be too harsh, but seriously all I remember from this talk was “tables are bad, tables are bad, it’s geeky to use tables (?? ), but tables are bad”. The third presenter was McVitte, the CEO of Texperts, talking about the mobile search perspective. Texperts is a mobile search SMS service that allows users to text a question to a (human) team of experts who text the answer back. The talk was okay, but wasn’t as technical as I was hoping it would be. The food was sponsored by Latitude and as sponsors they were allowed to give a small 5 minute business talk. I have to applaud them though for foregoing the marketing pitch and just wishing us a good time. We need more sponsors like that! There was more than enough food (mainly fried finger food) and by the end most platters weren’t even finished. The wine on the other hand went very quickly, although most people only had one glass. I shouldn’t complain; it’s better than having to pay yourself. The main problem with this event was the venue. While The Knights Templar is a great pub, it’s not quite suitable to hold an event like this. We were in two small upstairs rooms, but upstairs meant half a level higher in a sort of balcony overlooking the rest of bar with all the hassle and noise reaching us. Yeah, that’s not that great when you have an event with speakers. Next to that, the two rooms were connected with a small dark doorway and the presenters were forced to stand somewhere in the middle, so that people in both rooms could kind of see them talk (actually from where I was sitting I didn’t see anything). The rooms were supposed to fit 50 people, which might have been able if everyone was standing and all the tables were moved aside. As it was though (with everyone sitting at the tables) there wasn’t that much space at all; I barely left my seat only because there wasn’t any room to maneuver around. It wasn’t the best Girl Geek Dinner I’ve been to, but as usual it was great fun meeting up with some old friends and some new friends. 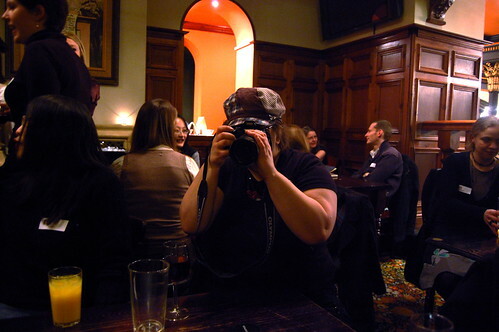 The next Girl Geek event is going to be a joint Geek Dinner and Girl Geek Dinner event with a surprise mystery speaker on April 26th [Upcoming]. Before that though is another Geek Dinner event on April 7th with David Terrar with a talk about creativity and the current education system [Upcoming]. So set the dates in your calendars, people, and I’ll see you there next time!